Part of the activity of any artist is getting your work out in front of potential fans who could become client/collectors. One of the ways in which I do this is through entering my work in juried shows. While the key benefit to getting accepted to such a show is the exposure to the buying public of your work, a side benefit is hand-delivering your work to the gallery when the gallery is far enough away to make the cost of packing and shipping it roughly the same as a road trip and overnight stay. The Limner Gallery in Hudson, NY is one such place. It’s a three-hour drive from Philadelphia and only about forty minutes from a wonderful airB&B we like in Woodstock – the town, not the music festival of the same name. The 1969’s counter-culture music event actually took place in Bethel, NY., sixty miles from Woodstock. So why was the three-day-long festival of art and music called Woodstock? Well, the investment group that financed the festival was Woodstock Ventures (and is in Woodstock) They could not secure a local venue large enough to handle the projected crowd of 250, 000, so they held it at Max Yasgur’s Farm in Bethel. Good thing they did, because 500,000 showed up. But I digress. The town of Woodstock, population 5,884 in the 2010 census, has embraced the whole notion and historical significance of the festival that bears its name. There’s plenty of tie-dye, new age shops and bookstores, organic produce, hip restaurants, and a weekend flea market (right across the street from the airB&B we stayed at). Buddha images and statues abound. 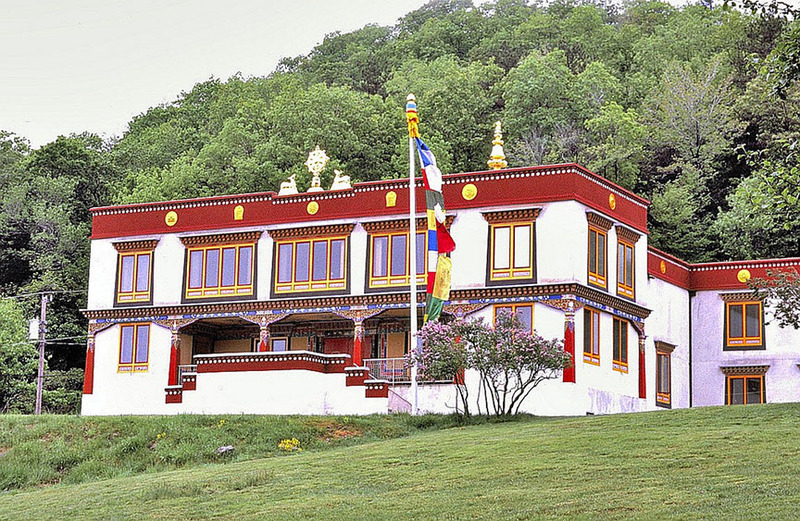 The Karma Triyana Dharmachakra Buddhist Monastery overlooks Woodstock. Even the local real estate office had a Buddha on their sign. And through Columbus day, there is the 2017 Woodstock Guitar Sculpture Exhibition. 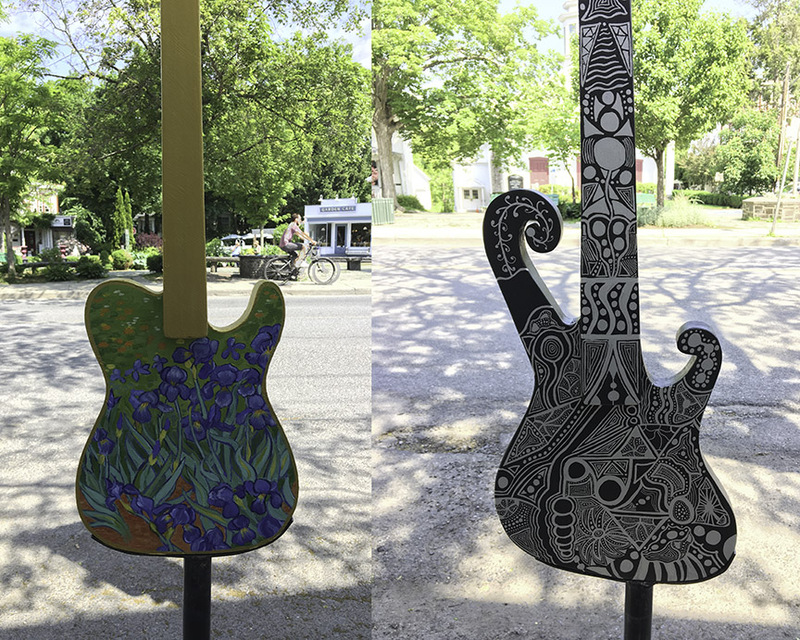 Dozens of guitar-shaped artworks installed on the sidewalks and in shop windows. On October 8th, they will be auctioned off to raise money for the Family of Woodstock Crisis Hotline. If you like drum circles, there is a Community Drum Circle in the center of town every Sunday from 4-6. Check out the short video I shot below. Got me swaying and foot tapping. 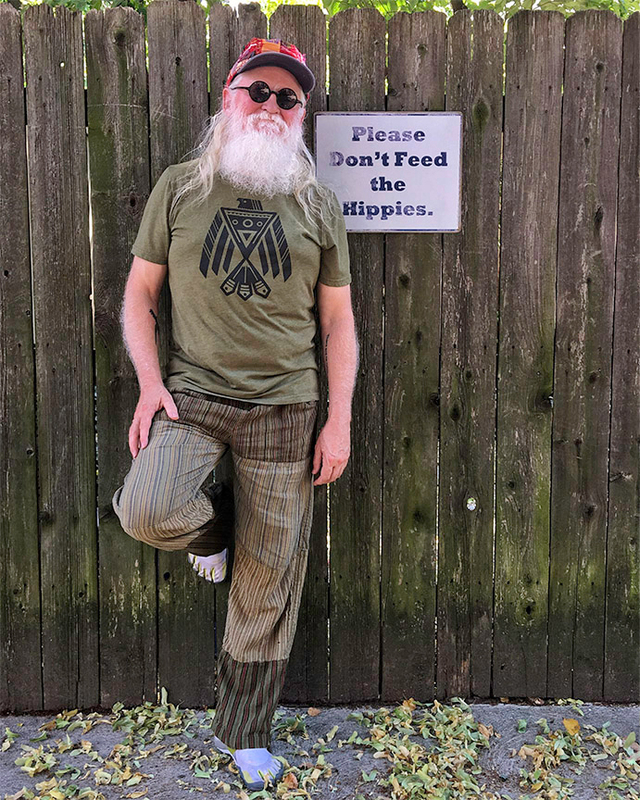 Needless to say, being an old hippie and all, I enjoy the vibe in Woodstock, NY. And please ignore the “Don’t Feed The Hippies” sign. Or, better yet, let’s meet for brunch at Oriole 9 on Tinker Street. You never know, you might run into Deva Premal & Mitten, as Betsy and I did during our last visit. Curious about where I got my cool threads? Well, I used to be a guest blogger at SoulFlower.com, and I love their stuff so much, I just can’t stop mentioning it. Check ’em out.